PONCE (pronounced “PON-SAY”) is an Amphibious Transport Dock. 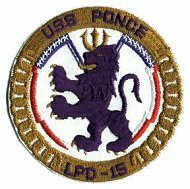 USS PONCE (LPD 15) is assigned to Commander, AMPHIBIOUS GROUP TWO as a unit of the Naval Surface Forces, United States Atlantic Fleet and is the 12th and last vessel of the AUSTIN class. Her mission is to embark, transport, land and support United States Marine Corps and Navy elements by sea and air, and to conduct amphibious landings or raids to secure beach heads for further prosecution of operations ashore. 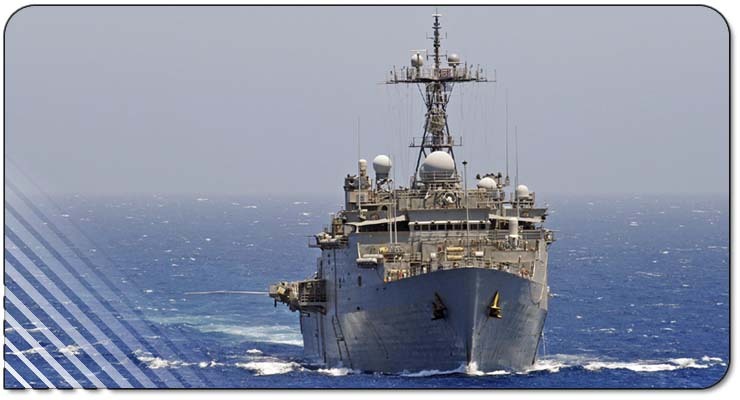 Constructed by the Lockheed Shipbuilding Company, USS PONCE was commissioned on July 10, 1971in Seattle, Washington. She is the first United States Ship to be named after the city of Ponce, Puerto Rico, which is named in honor of the Spanish explorer Juan Ponce de Leon. Since commissioning, PONCE has deployed numerous times to include the Mediterranean Sea, North Atlantic, Persian Gulf and operations in the Caribbean. Description of Coat of Arms: USS PONCE's insignia is comprised of four major elements: a rampant lion signifying the high spiritedness of the Navy-Marine Corps team that serves in her; a trident, emblematic of the U.S. Naval Power and supremacy; an anchor chain, linking the ships name and its designator symbols; the total purple lion, which is the coat of arms of Juan Ponce de Leon, a continuing reminder of our bond with the people of our namesake city. You may overhear several of the crew refer to our ship as the "Proud Lion".